At 10.30 on the morning of 26th May, 1941, a lone Catalina of 209 Squadron rediscovers the mighty German battleship Bismarck - pride of the Kriegsmarine - which had eluded the Royal Navy for more than 32 hours. Heavy flak surrounds the Catalina as she signals the position of the Bismarck - some 700 miles west of Brest - to the Admiralty. The following day, confronted by the Royal Navy battleships King George V and Rodney, supported by 2 cruisers, the Bismarck was sunk during one of the epic actions of modern naval warfare. 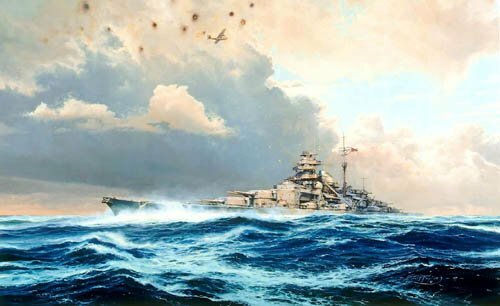 Overall print size: 32" x 23"
members who survived the sinking of the Bismarck.